This species is one of the most abundant of our Finches. It is also one of the hardiest, standing the winter of our Middle Districts, ranging as far north as Labrador, and crowding our old fields and open woods of the south from October to April. It is nearly allied to the Yellow-Winged Sparrow and Henslow's Bunting, but differs from both in many important particulars. It confines itself principally to the ground, where it runs with extreme agility, lowering its body as if to evade your view, and when in danger hiding as closely as a mouse; nay, seldom taking to wing, unless much alarmed or suddenly surprised. It is fondest of dry, rather elevated situations, not very distant from the sea-shore, and although it travels much, I have never found one in deep woods. During winter it associates with the Field Sparrow and Bay-winged Sparrow, and with these it is often seen in open plains of great extent, scantily covered with tall grasses or low clumps of trees and briars. Regardless of man, it approaches the house, frequents the garden, and alights on low buildings with as little concern as if in the most retired places. It migrates by day, when it suffers from the attacks of the Marsh, the Pigeon, and the Sharp-shinned Hawks, and rests on the ground by night, when it is liable to be preyed upon by the insidious Minx. Its flight, although rather irregular, is considerably protracted, for it crosses, I believe, without resting, the broad expanse of the Gulf of St. Lawrence. In June, 1833, I found it gradually moving northward as I advanced towards Labrador; and although a great number tarry and breed in all intermediate places from Maryland to that dreary region, I saw them there in abundance. The nest of the Savannah Finch is placed on the ground at the foot of a tuft of rank grass, or of a low bush. It is formed of dry grasses, and is imbedded in the soil, or among the grass, the inner part being finished with straw and blades of a finer texture. The eggs, from four to six in number, are of a pale bluish colour, softly mottled with purplish-brown. Some eggs, have a broadish circle of these spots near the large end, while the extremity itself is without any markings. It generally breeds twice every season in the Middle States, but never more than once to the eastward of Massachusetts. While searching for the nests of this and many other species, I observed that the artifices used by the female to draw intruders away, are seldom if ever practised until after incubation has commenced. Although this little Finch cannot be said to have a song, it is yet continually pouring out its notes. You see it perched on a fence rail, the top of a stone, or a tall grass or bush, mimicking as it were the sounds of the common cricket. Indeed, when out of sight of the performer, one might readily imagine it was that insect he heard. During winter, it now and then repeats a cheep, which, although more sonorous, is not more musical. In spring, when disturbed and forced from its perch, it flies quite low over the ground in a whirring manner, and re-alights as soon as an opportunity offers. Like all the other land-birds that resort to Labrador in summer, it returns from that country early in September. The Savannah Finch was found by Mr. TOWNSEND on the Rocky Mountains and about the Columbia river, where it was common. It extends along the coast of the Gulf of Mexico to within the Texas. As it is plentiful in Labrador, it might have been expected to move still farther northward in summer, but no mention is made of it by Dr. RICHARDSON. The situation and size of the nests, as well as the colour of the eggs of this bird, found by myself or the members of my party, differed from those examined in Maine, or in any other part of the United States. The nests were deeply sunk in the moss, always placed under the cover of creeping branches of low firs, and much more bulky than usual, although composed of the same materials. The eggs in most instances were of an extremely pale greenish hue, slightly spotted and splashed with light umber. They measured 6 1/2 eighths of an inch in length, and rather more than four and a half eighths in breadth. It breeds abundantly among the high grass at Chelsea Beach, near Boston. From Texas to the Columbia river, and along the whole Atlantic coast to Nova Scotia. Extremely abundant during winter in all the Southern States. Breeds from Maryland eastward. SAVANNAH FINCH, Fringilla savanna, Wils. Amer. Orn., vol. iv. v. 72. FRINGILLA SAVANNA, Bonap. Syn., p. 109. 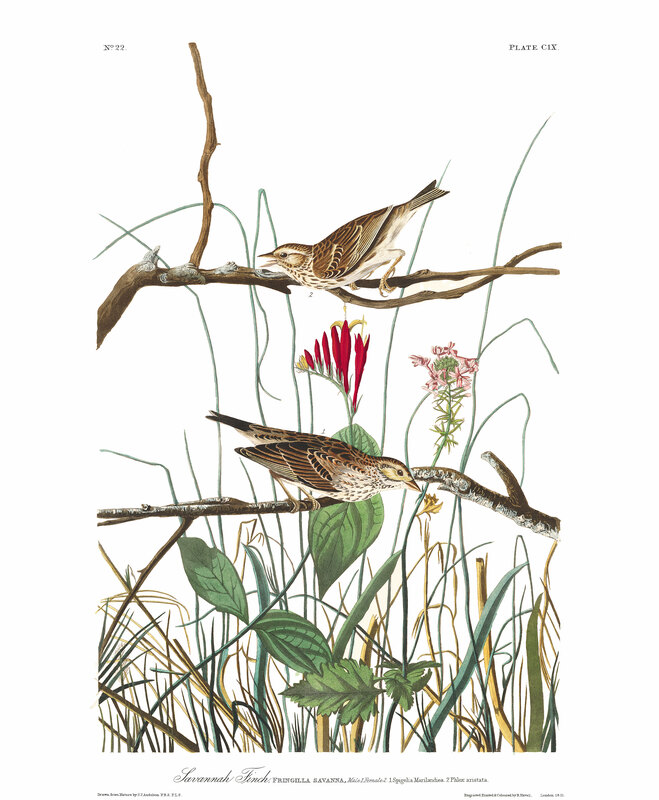 SAVANNAH SPARROW, Fringilla savanna, Nutt. Man., vol. i. p. 489. SAVANNAH FINCH, Fringilla savanna, Aud. Orn. Biog., vol. ii. p. 63;vol. v. p. 516. Bill short, conical, acute; upper mandible straight in its dorsal outline, rounded on the sides, as is the lower, which has the edges sharp and inflected; the gap-line straight, not extending, to beneath the eye. Nostrils basal, roundish, open, concealed by the feathers. Head rather large. Neck short. Legs of moderate length, slender; tarsus longer than the middle toe, covered anteriorly with a few longish scutella; toes scutellate above, free, the lateral ones nearly equal; claws slender, compressed, acute, slightly arched; that of the hind toe a little larger. Plumage soft and blended. Wings shortish, curved, rounded, the third and fourth quills longest. Tail short, emarginate. Bill pale brown beneath, dusky above. Iris brown. Feet light flesh-colour. Cheeks and space over the eye light citron-yellow. The general colour of the plumage above is pale reddish-brown, spotted with brownish-black, the edges of the feathers being of the former colour. The lower parts are white, the breast marked with small deep brown spots, the sides with long streaks of the same. Length 5 1/2 inches; extent of wings 8 1/2; bill along the ridge 5/12, along the gap 6/12; tarsus 10/12. THE INDIAN PINK-ROOT OR WORM-GRASS. SPIGELIA MARILANDICA, Pursch, Fl. Amer. Sept., vol. i. p. 139. --PENTANDRIA MONOGYNIA, Linn.--APOCYNEAE, Juss. Fig. 1. of the Plate [on left]. Stem tetragonal, all the leaves opposite, ovate, acuminate. Perennial. This plant grows in damp meadows, along rivulets, and even in the depth of the woods. It is abundant in Kentucky, as well as on the eastern ranges of the Alleghany Mountains, even to the vicinity of the Atlantic. Its rich carmine flowers have no scent. PHLOX ARISTATA, Mich., Fl. Amer., vol. i. p. 144. Pursch, Fl. Amer. Sept., vol. i. p. 150.--PENTANDRIA MONOGYNIA, Linn.--POLEMONIA, Juss. Fig. 2. of the Plate [on right].